Many of you have no doubt heard of Amalie Atkins, the recent Sobey Award nominee who graced the cover of last Spring’s Canadian Art. But what you may not know is that Amalie is also an active member of AKA Gallery. In fact AKA was the reason for her move to Saskatoon. After finishing her BFA at the Alberta College of Art and Design, Amalie accepted an internship at AKA where she became an integral part of our community. During her time here she fell in love with the laid back pace of Saskatoon life and, much to our delight, has stayed here ever since! Recently AKA visited Amalie’s studio as part of our new member’s feature series and we’ve come back inspired. The artist works from home, seamlessly blending her art practice with her life. The colour red is a visual thread that runs throughout her home and studio as much as it does in her surreal films. Gingham curtains adorn the windows and vintage vinyl red chairs surround the kitchen table. Giant felt animal heads hang on the walls. The cozy back porch is decorated with thick braids around a wooden desk cluttered with notes, thread and other materials used to make her picturesque movies. 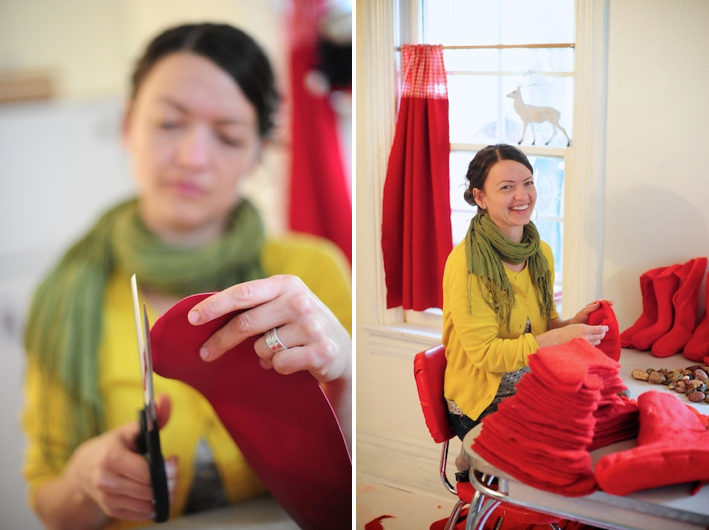 Her studio is in a separate building in the back yard, an old garage remade into a sewing and photo area. Inside is a red velvet backdrop and dresses hang on the walls. It’s hard to decide whether it’s her art that has coloured her interior spaces or whether those spaces have come to define her art. Amalie’s practice largely consists of short silent films set to music. These films may be shown alone or in an installation, like her most recent showing of “Three Minute Miracle” at MassMoCA’s Oh, Canada. There the film was screened within a hand-made felt tent set on a floor of salt-like glass grains. She explains that she wanted the tent to be a safe, comfortable space of retreat—something like a clubhouse. This sculptural approach to exhibiting her films is something that is slowly becoming an ever more important feature in her work. As her hand-made props amass and her filmic world expands, it bursts beyond the frame of the cinematic picture inviting the viewer to become a participant in the work itself. As she talks about future projects, she hints at new methods of juxtaposition, uses of space and multi-channel installations. Space is a theme Amalie returns to repeatedly in our discussions. It is central to how she constructs a film and so it only makes sense that her movies have started to bleed into reality. Theconnection between interior and exterior space remains one of the artist’s primary concerns. While her movies are often filmed outside, the world that is represented is profoundly introverted; it is based in myths, fairytales and personal symbolism. Her characters, often punctuated with splashes of red, whether it be their clothing or the objects they manipulate, perform ritualistic actions, the reasons for which are never made clear. While the allusions to recognizable fairytales are strong, such as the Little Red Riding Hood reference in “Scenes from a Secret World,” the traditional stories are turned upside down. In Amalie’s world, the girl in the red dress picks apples and feeds dangerous white snake-like creatures, what the artist calls “shark birds,” that dwell in the tall green prairie grass. The shark birds then attack the hero of the story, the wolf who sews the applesat night and hangs them on the trees. One night a shark bird bites off the wolf’s head and leaves his torso lying on the grass. As if to right the wrong of feeding the creatures, the girl in the red gingham dress sews his head back on and resurrects the wolf. The next day she finds that her dying tree has new apples but this time she does not pick them. In this fairytale world, it isn’t clear what lesson we are meant to learn but there seems to be something imparted to us anyway. The dramatic vignette, rather than functioning as a morality tale, seems to take the paradoxical structure of a story without a narrative. The formal structures of fables are utilized to make a mythical tableau that in the end teaches us a lesson we can’t quite put into words. It is this mystery that gives Amalie’s films an aura of haunted enchantment. Things don’t quite fall together yet seem familiar and even recognizable at times. In the end they are still like those sticky words that won’t quite get off the tip of one’s tongue, but stay stilted in a liminal space between what is said and unsaid, seen and not seen. Amalie’s most recent work in Saskatoon was titled “Embrace,” a public art video projection taking up an entire storefront window on 20th Street. If you’re curious to see more, AKA will be screening “Scenes from a Secret World” at East/West, a group video screening curated in collaboration with Modern Fuel Artist-Run Centre. Keep an eye out on our website for more details! Currently Amalie is looking for performers for upcoming projects. Specifically she is looking for sisters, female twins or friends who look similar. If you and a sister or friend are interested, please contact Dagmara Genda at director@akagallery.org and we’ll put you in touch with Amalie. See more AKA Members Features here. Amalie Atkins’ website can be seen here.